McHenry County Circuit Clerk and Sheriff Department had several data-driven application needs. PlanetJ presented a cost-effective, comprehensive way to achieve much of their development in-house using Web Object Wizard and WOWFusion Charts. McHenry County, IL, like all counties in the United States, had the need to present real-time data to end users via the internet. PlanetJ provided them a way for developers in multiple departments to build their own applications and serve end users in the Circuit Clerk and Sheriff Departments as well as the public within the County. PlanetJ provided McHenry developers a two day training session and they have since been using WOW to provide solutions across their county departments. The Circuit Clerk department to date has developed eight applications ranging from public information queries to judge case management system portals. The sheriff's information portal allows deputies to look up case information including case details, parties involved and hearing information through a secure password protected site. Dashboards have been integrated using WOWFusion Charts to show case summaries and dashboards by type, date range, and other demographics. These dashboards include the ability to drill down into detailed information. A WOW application has also been created to help judges in the county securely access case forms and documents via an easy-to-use browser based application. This system integrates with an existing document management system located on a county Windows server. The Public Case Access application allows citizens of the county to search the court docket by various criteria. One of the detailed searches is seen in the screen below. Searching options include case number, ticket number, party or business name. You can see that the Case # column on the left is highlighted. The user can then drill down into more case detail by clicking on the case number of interest. This was a very quick application to build and it is saving the county a ton of time in fielding questions. Dashboards, similar to the screen below, allow McHenry County court administration to see court case summaries based on type, date range, and various other demographics. Drill down information is available for each case directly from the dashboard as well. 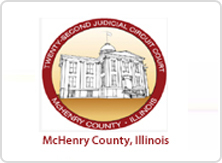 The County of McHenry, IL, in using WOW, found a very cost effective, in-house solution to many of their data driven application needs. WOW seamlessly integrated into their existing RMS and provided the end users real-time data. The county has been very pleased with their use of WOW and they have plans for future development. WOW is a great solution to county government needs.